At first blush it might seem odd to brand Hamilton as a “music city.” After all, what does our “ambitious city” have in common with any of those other notorious music towns, like Nashville, Memphis, Seattle or that other city down the road whose name shall not be spoken? Well, turns out it has more in common than most people think. Hamilton’s music scene is one of the most active and vibrant in all of Canada. The city is home to several hundred working musicians, including many JUNO and Grammy Award winners, and about 50 music organizations, including symphony orchestras, choirs, musical societies and choral groups. It also has some impressive music performance spaces, like First Ontario Centre and Hamilton Place, and a whole whack of great recording studios and music-related businesses. The Hamilton Musicians Guild, which boasts over 600 paid-up members, is the fastest growing local in all of North America. 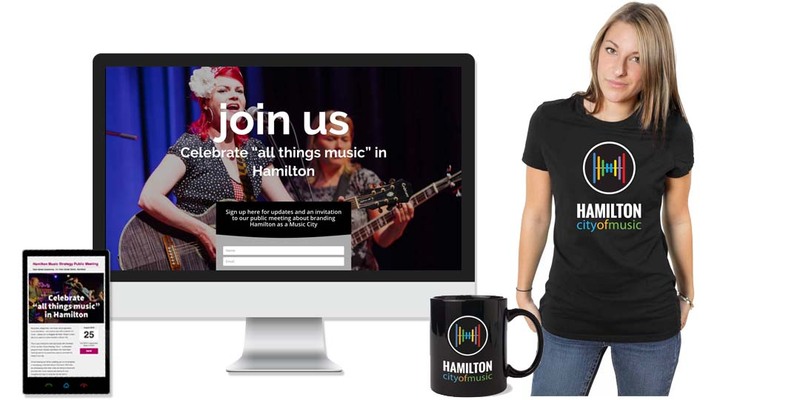 Even so, the idea of branding Hamilton as a music city seems ambitious to many in the music community. Overcoming this skepticism, especially among musicians who have laboured for years to achieve recognition, required (and will continue to require) comprehensive stakeholder engagement, a credible and inspiring vision, and the ability to deliver on all the promises that are made. To manage this complex project, the City of Hamilton hired Pier 8 Group to develop the brand, create a marketing plan and carry out a public consultation process. We began by meeting with the City’s Music Strategy Implementation Team (MSIT), which includes several high-profile members of the local music scene. We also conducted nearly two dozen interviews with prominent musicians, directors of music organizations, music educators, radio program directors and owners of music businesses. To engage broader layers of the community, we launched a social media campaign that reached out to more than 13,000 people, informing them about the project and inviting them to a public meeting. We also had an opportunity to meet with a group of café, club and bar owners who are working to create a live music venue operators association in the city. As a result of this stakeholder engagement process we were able to generate a considerable amount of buzz and interest in the music community. The discussion about whether Hamilton could be a “music city” – or was already a music city – reflected a wide range of views within that community and contributed to a better understanding of the strengths, weaknesses, opportunities and challenges the City faces in moving forward with its plan. The exciting new brand that we developed in collaboration with our design partner Walter Pick of Headspring Marketing, perfectly captures the spirit of excitement, vibrancy and diversity of the local music scene.